Beijing: China and Pakistan have agreed to enhance cooperation on counter-terrorism in their first strategic dialogue since the recent military flare up between Islamabad and New Delhi. 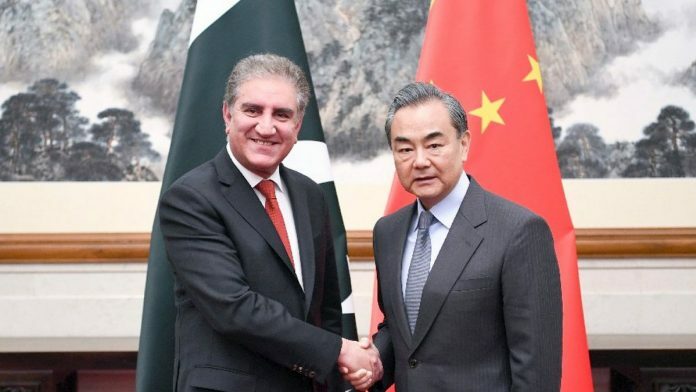 The meeting between Chinese Foreign Minister Wang Yi and Pakistani Foreign Minister Shah Mahmood Qureshi came as Islamabad awaits more than $2 billion in commercial loans from Beijing in a bid to shore up foreign-exchange reserves and stabilize its economy. Pakistan is one of the biggest beneficiaries of President Xi Jinping’s signature Belt and Road trade and infrastructure initiative, through which some $60 billion has been poured into roads and power plants that give China a path to the Arabian Sea. Some of those projects are being built in Pakistan-administered Kashmir, infuriating India. Answering a question about whether CPEC is a “debt trap” or might only help certain parts of Pakistan, Wang said the project is “oriented towards the entire country of Pakistan” and noted only 20 per cent of CPEC projects were funded by Chinese loans. Closer ties between China and Pakistan could impact tensions in South Asia, which has seen a tense military standoff in recent weeks over Kashmir, which is claimed by both Pakistan and India. “No matter what kind of changes take place in the international system or the region, we will always resolutely support the maintenance of Pakistan’s sovereignty,” Wang said. The flare-up began when Pakistan-based militant group Jaish-e-Mohammed claimed a Feb. 14 suicide bombing that killed 40 troops in an Indian-administered area of Kashmir. On Monday, India confirmed it had sent nuclear submarines, an aircraft carrier battle group and other naval vessels to the North Arabian sea after the attack. Since the recent tensions arose, China has reiterated its position that the two sides should be encouraged to resolve their differences through dialogue and that Pakistan’s anti-terrorism efforts should be encouraged. Chinese Vice Foreign Minister Kong Xuanyou also visited Pakistan earlier this month to discuss the situation with officials there, the ministry said. Some kind of joke.. ?? Wow! Great news! Two devils will fight terrorism together???? Really it is an international news for which both Xi & Bajwa must get noble peace prize for an attempt to fool the world!!! !